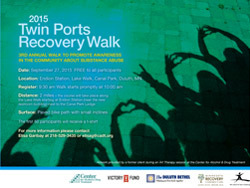 The Twin Ports third annual Recovery Walk to promote awareness in the community about substance abuse will take place Sunday, September 27. Sponsored by the Center for Alcohol and Drug Treatment (CADT), Minnesota Adult and Teen Challenge, The Duluth Bethel, Victory Fund, and the Minnesota Recovery Connection, the two-mile walk will begin at Canal Park’s Endion Station and proceed down Duluth’s Lakewalk. The walk is free and open to everyone. Walkers can register at 9:30 a.m. The walk will begin at 10:00 a.m. The first 50 walkers will receive a t-shirt. For more information, contact Elisa Garibay at 218-529-3435 or elisag@cadt.org.